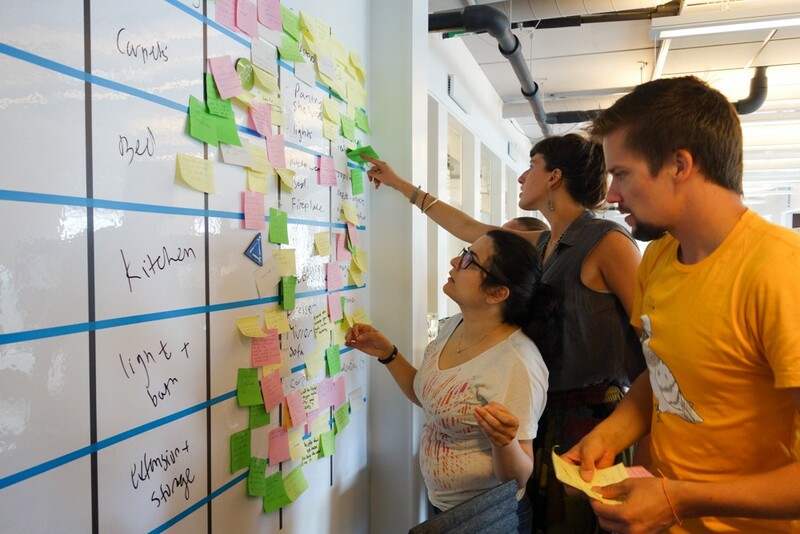 In September, the Near Future Laboratory conducted a workshop with the Mobile Life Center and Boris Design Studio in Stockholm. 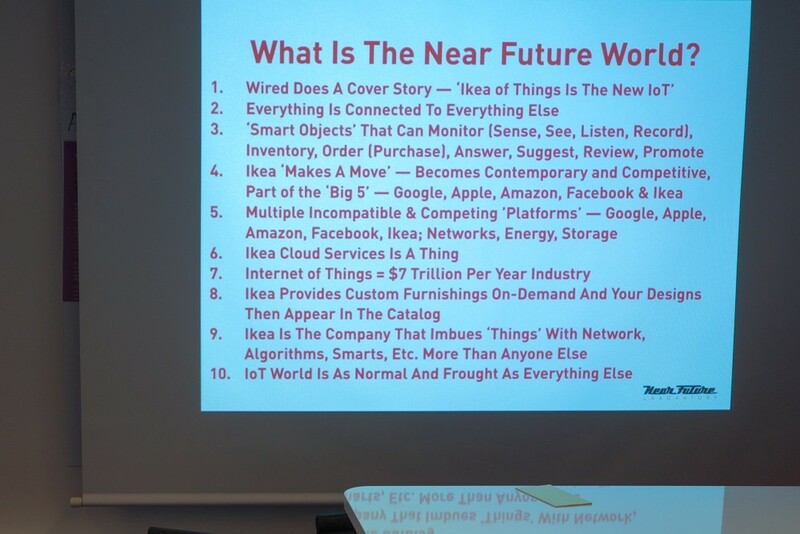 Our workshop brief was to consider an Internet of Things future, but with a twist: the Internet of Things seen through an Ikea Catalog. Why did we chose an Ikea catalog? Because it is one of the more compelling ways to represent normal, ordinary, everyday life in many parts of the world. The Ikea catalog contains the routine furnishings of a normative everyday life. It’s a container of life’s essentials and accessories which can be extrapolated from today’s normal into tomorrow’s normal. The process of our workshop was to use Design Fiction, a practice we’ve developed at the Near Future Laboratory that combines pragmatic hands-on production of material assets — in this case, graphic design production of a print catalog — with micro-scale science, technological and social fictions contained in the product descriptions, ancillary texts, disclaimers, footnotes and annotations. The Design Fiction approach requires one to follow a series of claims about the world through as deeply as possible. For example, our claims to say that the near future world we were representing would have ‘smart’ ‘connected’ technologies needed to be as thorough as possible given our 1-day schedule. We needed to propose dozens of representations of such, throw out most, iterate on the one’s we found compelling and then find a plausible, visually engaging way to represent them with all of the constraints and rules one applies to catalog production. Each proposition from each of the working groups had to ‘stand up’ to our own scrutiny. Names of things weren’t enough. Each group had to describe the artifact or service as if they were pitching a new product. This is the work that seems to be rarely done when an IoT future is trumpeted in vague, hyperbolic press releases, keynotes and ‘reports.’ A bad PowerPoint slide with some loose text about ‘a future of connected kitchens’ and $1 trillion market for IoT simply would not work. For example, our extrapolation of an Ikea kitchen has the things you might imagine (and have been “demo‘d”) in a near future IoT world. Cooking instructions appear dynamically on countertops, complete with anecdotes meant to keep the cooking experience lively — and likely complete with subtle opportunities to make a purchase of a fancy cutting knife, or book a reservation to the country from which the recipe is derived. The micro-fictions embedded in the catalog are where our Design Fiction makes subtle suggestions about how the near future may be a bit different from today. 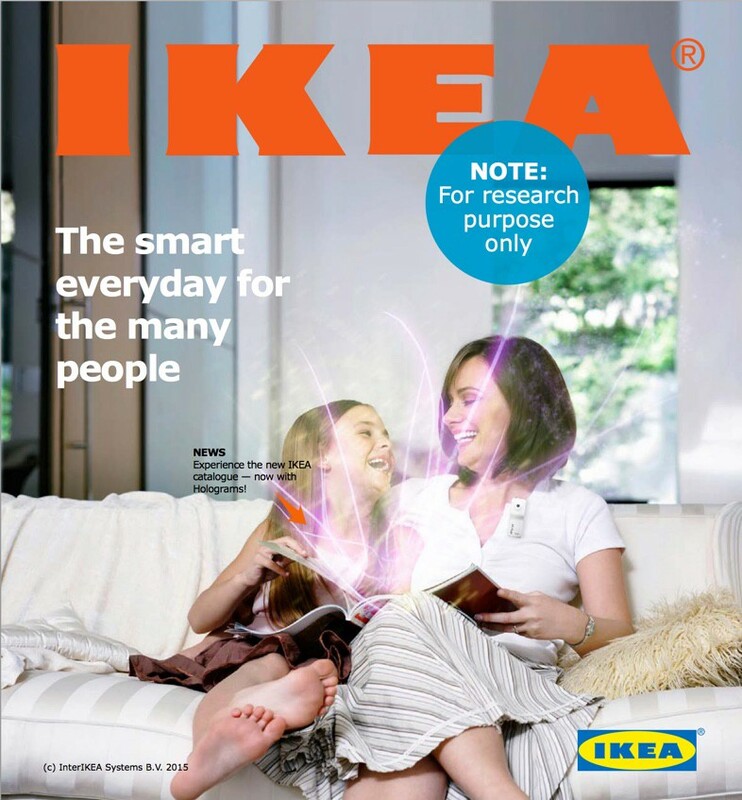 For example, implying new economic contexts that were an aspect of the design brief can be done in subtle ways, such as peculiar regional disclaimers, odd explanatory iconography, subscription pricing models for furniture as the ‘new normal’ — in our near future, an Ikea kitchen is ‘self-subscribing’, a peculiar, eyebrow-raising neologism meant to suggest a new weird context of exchange dreamed-up by some near future product people in which our near future selves are comfortable with smart technologies that somehow know what’s best for us. In the end, our Design Fiction Ikea catalog is a way to talk about a near future. It is not a specification, nor is it an aspiration or prediction. The work the catalog does — like all Design Fictions — is to encourage conversations about the kinds of near futures we’d prefer, even if that requires us to represent near futures we fear. While we’re fans of the ‘catalog’ as a Design Fiction Archetype (cf TBD Catalog), we’ve also done Quick-Start Guides, Newspaper Supplements, Reports on Modern Life & Rituals, bespoke Design Fiction Field Reports for clients, all as ways to enter into a discussions about our future. 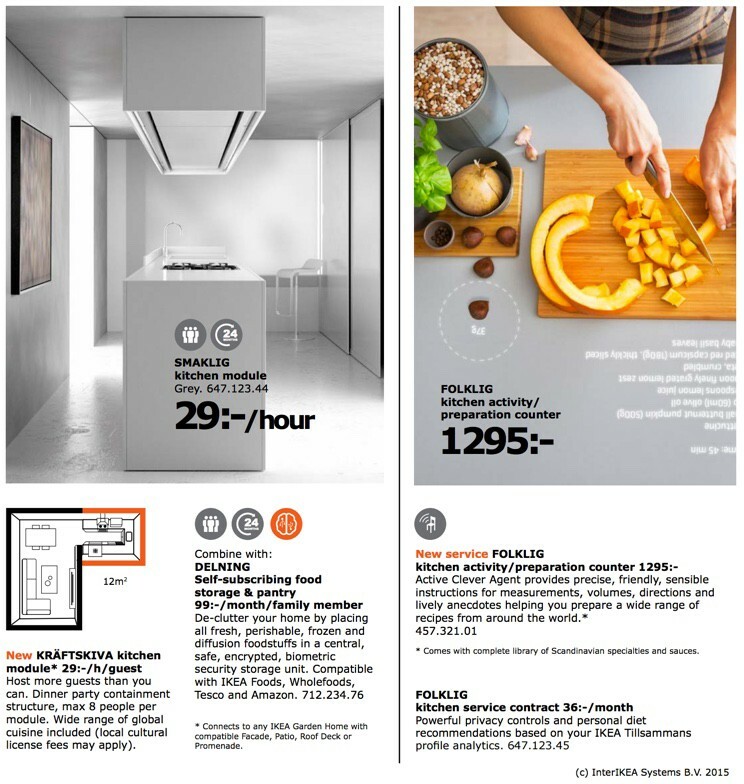 Download your PDF of the Ikea Catalog Supplement (IoT Edition).